This is a story about the additive value of the two nouns in the title of this article. I used both of these nouns to accomplish goals that I set for myself. I used them to accomplish career goals in engineering and most recently goals that I set for myself in my second career, watercolor painting my true vocation. Long after being in my engineering career, I set a goal to acquire a professional engineers license in the State of Ohio. This involved a two-step process. The first step was to study and take the fundamentals of engineering exam. This was no small feat since I had been out of college for many years. I passed the exam on the first attempt. I did not score my highest grade or the grade that I wanted and thought I was good enough for but, I passed according to the state board of engineering criteria. Step two was a bit more complicated. I began a study regime that required night school prep classes at a local college. I always loved the classroom but I had been away from school for a long while. So, night school and exam prep handbooks required hours of example problem solving. I filled notebooks with examples. I practiced over and over, consistently. I did not receive a high enough grade on my first try but tried again. I studied and studied and practiced and finally, with my persistence I passed the PE exam and became a PE in mechanical engineering in the State of Ohio. That is a short story of history about my prior career. I picked engineering because I had a family and was good enough to find work with my skill set. My true vocation was and continues to be ART, specifically watercolor painting. Watercolor painting has been my chosen medium besides pencil since I left high school. I was good there but not good enough for art school. I chose engineering instead. I knew how to draw and paint but needed more guidance. I found a guide and a group of critics that helped me. And because of my competitive nature, realized there were goals to accomplish along the way. There were competitive shows to enter and hope to be accepted in. Then there were watercolor organizations to apply to and be accepted in. So, like engineering, I practiced and studied and painted and drew. I was happy to be accepted in local, regional and state competitions. I was even happier winning prizes. But, like the lure of the engineering license, I was drawn to compete in organizations with strict criteria for membership. I made many entries and finally by persevering I found signature membership in the Ohio Watercolor Society, OWS. I didn’t make the “grade” the first attempt because my portfolio was too broad, not enough focus and consistency. Nevertheless, I made signature status in OWS in 2006. There are many watercolor societies across local, state, region, national and international boundaries. 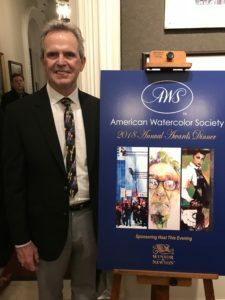 I came to understand that the American Watercolor Society, AWS was regarded by most to be the top in the watercolor world. AWS was once referred to as “High Society” in one of the popular art journals. I was awed by the entries in the annual AWS exhibitions. I still am. I wondered if I dare compete with those “professionals”. I had to give it a try. 2006 was the first time that I entered the American Watercolor Society International Exhibition in NYC. My entry was accepted. I was surprised and thrilled beyond belief that my artwork was good enough to be accepted along with all of the premiere teachers and exhibitors that I read about in art journals and society news. I now had my sights set on the higher prize, Signature Member status in the American Watercolor Society. More practice more workshops more training more painting more entries. There were lots of “thanks for entering but….” letters and announcements. Finally, in 2018, my next entry was accepted for the 151st AWS International exhibition again in NYC. The accepted entry was a piece that had been rejected by the AWS jury in 2015. I knew that it had a chance. My persistence paid off. I was thrilled! It had been a long wait. But that was not the end of the story. Two entries are not enough to achieve signature member status in AWS. Not one, not two but three exhibitions are the threshold for signature member status. The 152nd AWS exhibition in 2019 was my next chance. With fingers crossed and two entries in the mail before the entry deadline I sat waiting for the juries’ verdict. One of my entries was a bicycle scene that had won a top tier prize with the OWS in 2015. I was sure it was a winner or that it would be the “one”, the third one. I entered a companion piece, one of a series of cityscapes that had never been in competition at any level. The results were announced on January 7. My cityscape was accepted as the third and final piece for me to qualify for signature member status in AWS. I knew it was only a matter of time since AWS is part of my last name, L AWS ON. Upon reflecting on this long process, the cityscape was the one that was finally accepted because of its consistency. It was companion to the previous successful AWS entries. All three of the pieces make up a consistent portfolio of NYC street scenes. Although they are not the same location but not far apart. All are street locations in Manhattan, my favorite city subject matter. This is all about the road to goal fulfillment. I no longer need a PE for anything. That career is no longer in play. The OWS and AWS disignations are in play and indicative of the professional status of my chosen vocation. As Antonio Masi, president of AWS once said, “my member status is much the same as Doctor of Painting”. I’m with the pres on that.